When choosing mobile phone insurance, it can be difficult to decide which insurance is right for you. You may already have been made aware that you can insure your phone through your home or contents insurance, your bank, through your mobile network or directly through a pure play provider. However, some of these insurers offer varying levels of cover, with some excluding certain insurance cover, like accessory cover or if you damage your phone outside of your home. To help you make an informed decision, we will compare mobile phone insurance from four different types of provider and take a look at what you get for your cover. If you take out mobile phone insurance with your bank, it will usually be as freebie that has been offered to you by being a packaged premium account customer. This could cost you £15 or more per month, as opposed to around £7 per month that you could be paying with stand-alone phone insurance. 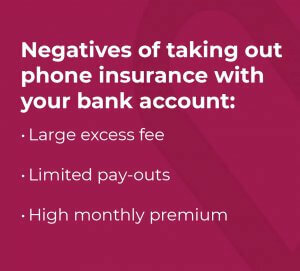 Bank phone insurance may require you to pay large excess fees, that can be up to £100 per claim, whereas many specialist mobile phone insurance providers will have much small excesses. Most banks that offer phone insurance, including Barclays, Halifax and Lloyds have a limit on the amount of claims you can make, which is usually around 2 per 12-month period. Mobile phones and other gadgets are only covered under home insurance if the theft or damage happens within your property itself, such as in a house fire, flood or burglary. This means that if you drop your device, lose it or it gets stolen outside of your house, it may not be covered in your policy. Stand-alone mobile phone insurance plans will protect your gadgets wherever you are. Under home insurance, you do have the option to cover your personal possessions, so that they are protected outside your property, however it will cost you an additional £25-35 on top of your annual premium. 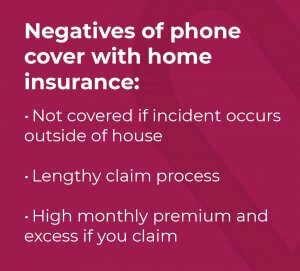 If you do have to claim on your home insurance for your mobile phone, your no-claims bonus will be affected, you may have to pay a high excess and an increased premium each month. Generally, these types of claims on home insurance also take a longer time to be processed, whereas some specialist mobile phone insurance companies can provide a next-day replacement device, and at the very most, within a couple of days. When you purchase a phone from a network provider, they will usually ask you whether you would like to insure it there and then. For example, with o2 phone insurance, you have to insure your device within 28 days of purchasing it. Network providers can quickly replace your handsets, which means they can offer you a speedy service. 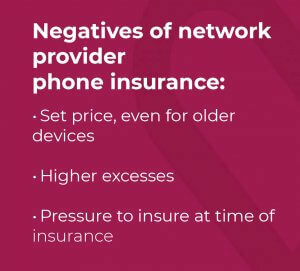 However, there are some drawbacks to taking out phone insurance with your network provider, the first being that the cost is usually set across all handsets, even for older models. Comparatively, pure play providers will tailor the cost of your plan to your device. Even the cheapest network provider option is still more expensive than a pure play provider, so you may end up paying more per month for a less comprehensive cover. Generally, they will have higher excesses and a limit to the number of claims you can make in a 12-month period, for example Vodafone phone insurance has an excess fee of £79 and a limit of three claims per 12-months. But don’t forget to check the details of your phone warranty, as this may cover you for certain damages already. Unlike the other providers previously discussed, pure play providers have many benefits. 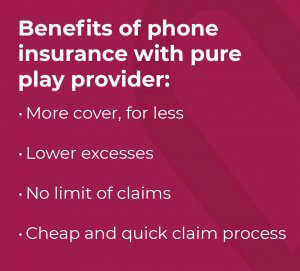 As we specialise in mobile phone and gadget insurance, you are getting experience, expertise and efficiency when you insure your phone with a pure play provider. Not only is the claims process quicker, as it is our sole concern, it is also the cheapest option, with monthly payment as little as £6. Some specialist phone insurers, like loveit coverit, will have no limit for claims, as well as multi-gadget policies and discounts. Pure play insurance policies are extensive, offering more cover for your money. For example, loveit coverit’s insurance policies include loss as standard, theft, accidental damage, liquid damage, mechanical breakdown, accessory cover and worldwide cover. Another benefit of a policy like ours, is that you are not tied into a lengthy contract and there is a 14-day money back guarantee on repairs and replacements. So if you have just bought a phone with EE, Vodafone or another network provider and are looking for comprehensive phone insurance with cheap excesses, choose a pure play provider like loveit coverit. Amazing customer experience with loveit Coverit. Very cheap monthly cost, extremely low excess cost. With a cracked screen and a quote from Apple the funds were transferred to my account with no dramas many thanks guys I will Recommend your services! Very easy to arrange and set up the cover and the communication confirmed when everything had been done properly. The instructions were very clear. Great service thank you.